Firstly, you are forgiven for thinking that Bos Angeles might the musical product from sunny Southern California, not just for namesake but for the fact that one blogger rather appropriately described their music as ‘summery shoegaze’. Bos Angeles hail not from SoCal but from the South Coast of England and are made up of Richard Board (vocals, guitar), Ben Perry (drums), and George Rothman (bass). As columnist Paul Lester said when the trio were named ‘New Band of the Day’ in The Guardian back in October 2011, the music of Bos Angeles is equal part “Mancunian miserablism and West Coast exuberance”. 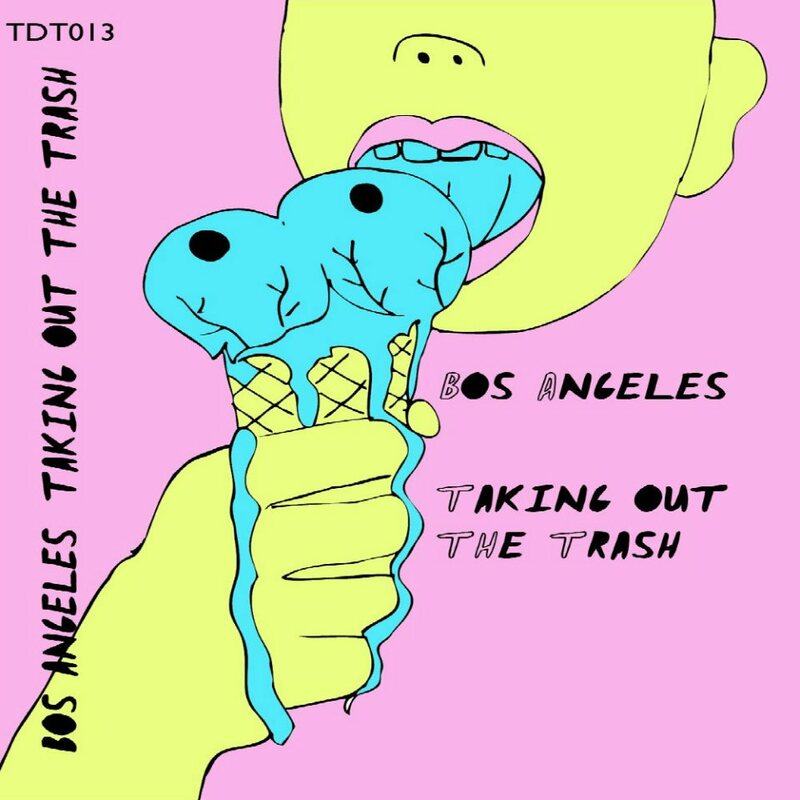 ‘Taking Out The Trash’ is a 21-song cassette compilation made up of four unreleased EPs from Bos Angeles. The compilation chronicles back from March 2011 to June 2012 and as you make your way through the track you will notice the change and refinement in the band’s style and sound. That said, even in their earliest work the songcraft has always been top notch. With the average song clocking in around two and half minutes, Bos Angeles master the art of combining pop hooks with punk speeds. The first four tracks including the brilliant opening track “Beach Slalom” showcases the band’s punk side without the west-coast surf-rock influence that would take centre stage in the band’s later works. “Beach Slalom” also has one of the best and most nostalgia inducing guitar melodies on the album – just think “Public Image“, or even The Cure. “June” sees Bos Angeles emphasise their dreamy and shoegaze elements to the extreme while “Makin Waves” is gritty in its recording and style; think The Jesus and Mary Chain meets Joy Division meets The Cramps. Tracks five and six, “It Felt Like A Kiss” and “Endless Summer”, sees the band slow up on the pace and almost into a plod. It’s during “It Felt Like A Kiss” that the band first really introduce the 50’s influence, even bordering on doo-wop, and here Bos Angeles are most reminiscent of The Drums early work. Post-punk track “Terror Tides” has a melodic guitar line to die for and combined with a shoegaze monotone vocal Bos Angeles sound oh so effortlessly cool. The recording of “Shivers” is almost crude in its recording (as are “Shallom Goy” and “I Hate It When You Look At Me”, which follow) but all noise aside, like almost every one of the 21 songs on the compilation, it is a delicious pop song delivered with irresistible energy. The band clean up their sound as of track 13, “Paradise” and this track along with the handful of songs that follow really emphasize the influence of 50’s style melodies. “Tearing Your Heart Out, One String At A Time”, which Sound Advice reviewed earlier this month (read review), is the perfect pop song featuring a driving bass line, disco-beats, surf-rock guitars, and sugar-coated melodies drawing to mind The Jesus and Mary Chain (and more recently Crocodiles). Similarly, closing track “You’re The One I Want” is a perfect example of the band having refined their sound and harnessing all their strengths; dreamy, melodic, nostalgic – all delivered with post-punk vitality. A thrilling mesh of post-punk, noise-pop and indie-rock, ‘Taking Out The Trash’ is a brilliant collection of tracks and a Sound Advice favourite for 2012. ‘Taking Out The Trash’ will be released 26 November as a limited edition cassette of just 200 copies (check them out on the Tye Die Tapes Tumblr). Pre-order Now and receive an instant download.